Craving Mexican? 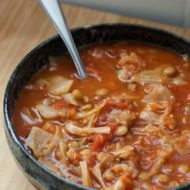 Simply toss all the ingredients for fajitas in your slow cooker and a few hours later you’ll have a comforting soup that’s packed with flavor and a hint of spice. 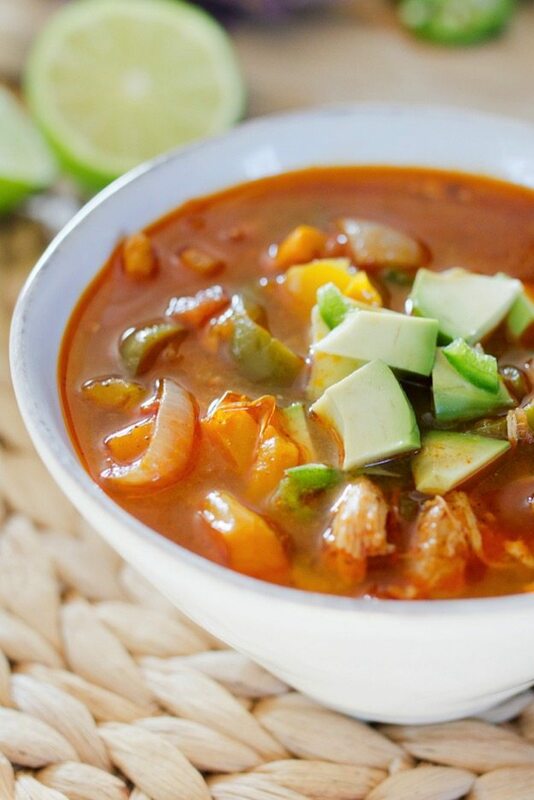 This fajita soup is gluten-free and paleo. Do you know what makes me incredibly happy? Getting done with work for the day only to realize that dinner has finished cooking and is ready to serve. That’s why I LOVE slow-cooker meals! Most have very little prep work involved — you literally put everything in, turn the slow cooker on and let it work its magic. This recipe does require some chopping, but once everything is sliced and diced you’re ready to roll. Expert advice — do NOT plan to do an at-home workout while this soup is cooking. About three hours in it starts to smell heavenly and working out with the aroma of Mexican food wafting through your house is like being tortured. That said, once the workout was over (and we had showered) dinner was on the table in less than ten minutes, which was pretty awesome. Overall, this recipe is pretty straight-forward. All the ingredients you’re used to using for fajitas, just a bit more liquid to make it into a soup. After slow cooking for several hours the chicken gets tender, the peppers soften and the broth develops a robust, spicy flavor. We ended up eating this soup for dinner two nights in row and like most soups it was even better the second night. Isaac mentioned how good it was several times so I have a feeling I’ll be making it again soon! For the chicken I used boneless, skinless chicken thighs to add a bit of fat and flavor. If you prefer white meat, feel free to use chicken breast. You may just want to add an extra teaspoon of olive oil. For my vegetarian and vegan folks, use 1-2 cans of rinsed and drained chickpeas in place of the chicken. If you’re not a fan of spice (or serving kiddos) simply leave the jalapeño pepper out. The soup has plenty of other spices to make it flavorful. Craving Mexican? 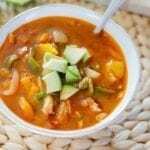 Simply toss all the ingredients for fajitas in your slow cooker and a few hours later you’ll have a comforting soup that’s packed with flavor and a hint of spice. 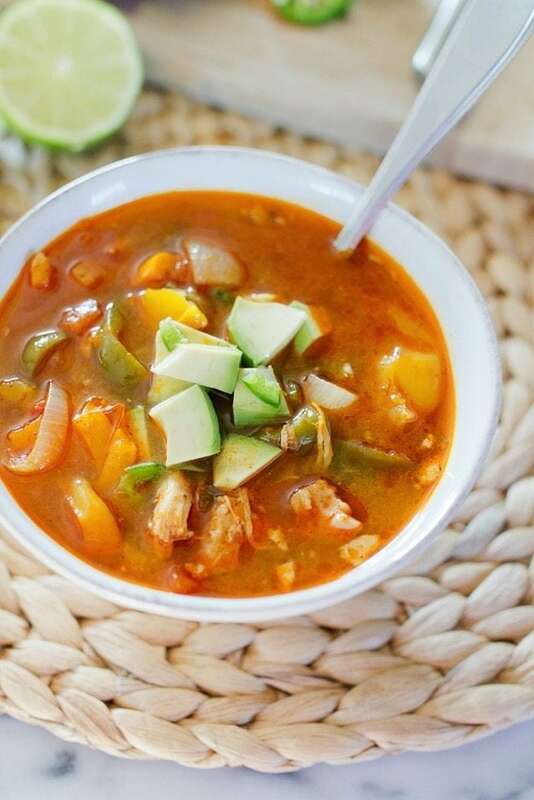 This fajita soup is gluten-free, grain-free and paleo. Cook for 3-4 hours on high or 6 hours on low. The chicken should be cooked through and will just fall apart. Once this happens turn the slow cooker to warm and enjoy whenever you’re ready. To serve, top each bowl with avocado, jalapeño slices, cilantro and serve with tortilla chips and a slice of lime. In addition to my fajita soup recipe, this month I’m teaming up with my favorite blogging ladies to share five additional slow cooker recipes and host an awesome slow cooker giveaway. Not only do these recipes look and sound amazing, they’re healthy and paleo-friendly! Ready to see them? 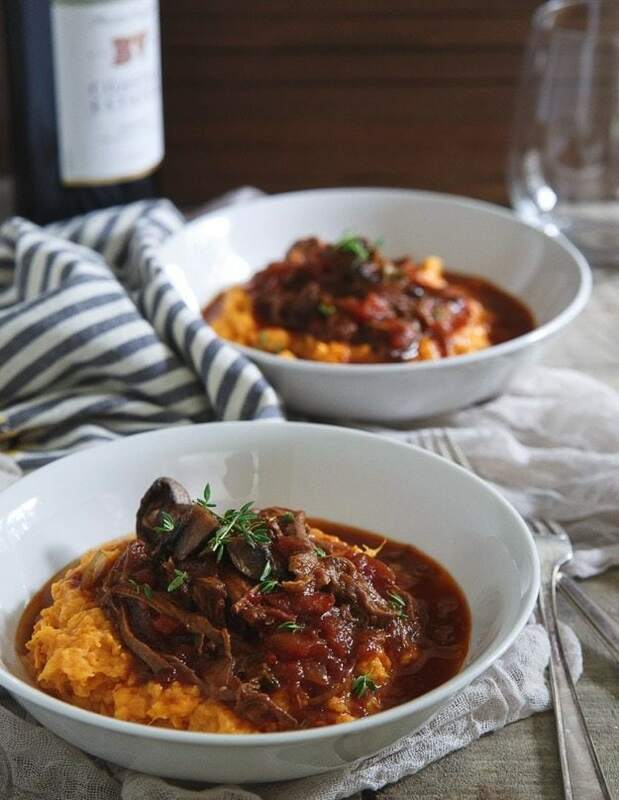 Serve it over mashed sweet potatoes or toss it with pasta, either way this slow cooker short rib ragu is the perfect comfort food as the weather gets cooler. 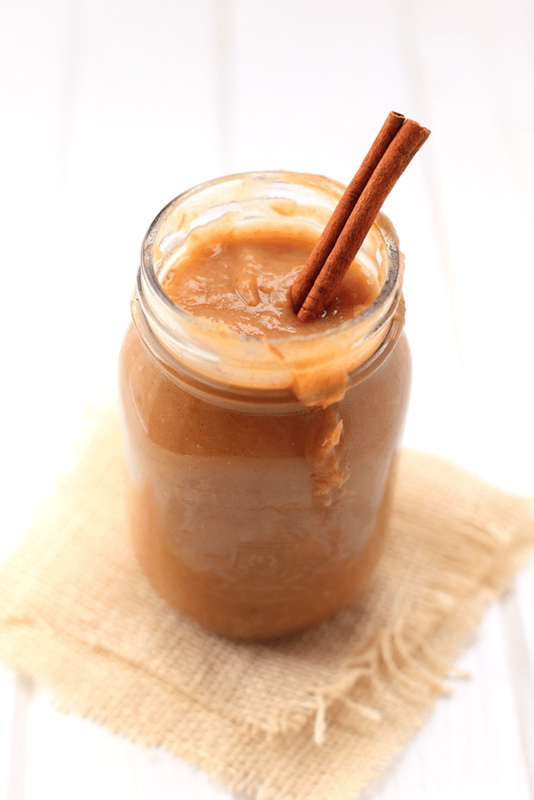 All you need are two ingredients (apples and cinnamon) and your slow cooker to make this super easy and sugar-free slow cooker applesauce recipe! Perfect for Fall snacking or to use in baked goods! Dinner has never been so good! 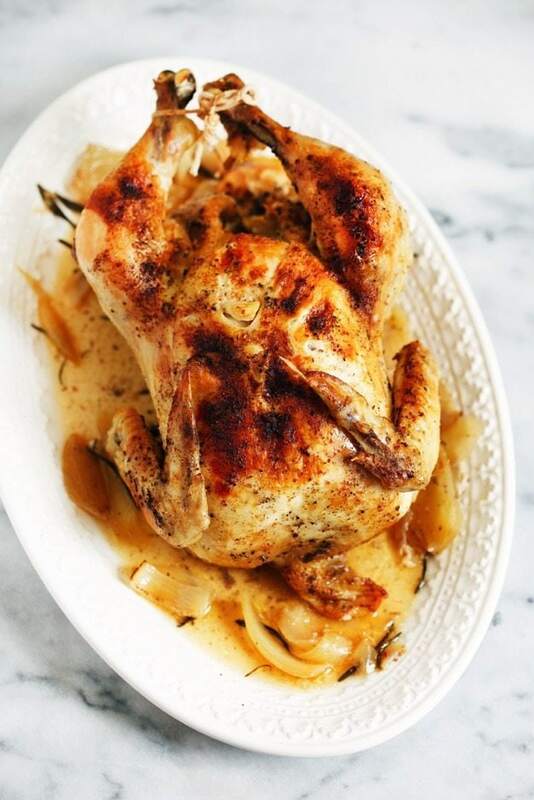 Packed with delicious flavors, this slow-cooked roasted whole chicken is so easy to throw together, and makes for the perfect meal! Pair it with veggies, salad, or anything you’d like and you are ready to go! 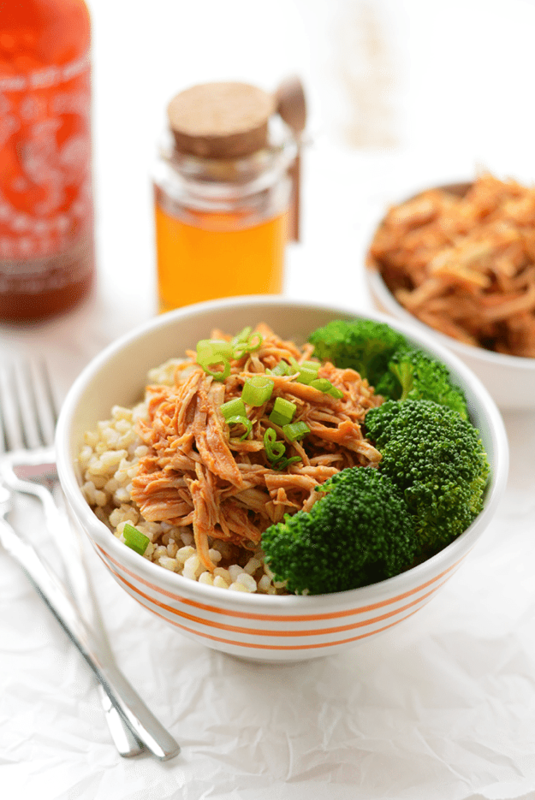 All you need are 5 ingredients to make this delicious, clean-eating slow cooker honey sriracha chicken that’s made with REAL food. Last but not least, in honor of slow cooker season the girls and I are teaming up with Hamilton Beach to host a slow cooker giveaway. I don’t know about you, but I’ve never been a huge fan of slow cooker recipes that require pre-cooking because I hate dirtying up another pot. The slow cooker we’re giving away solves this problem because the inner container is stovetop safe! 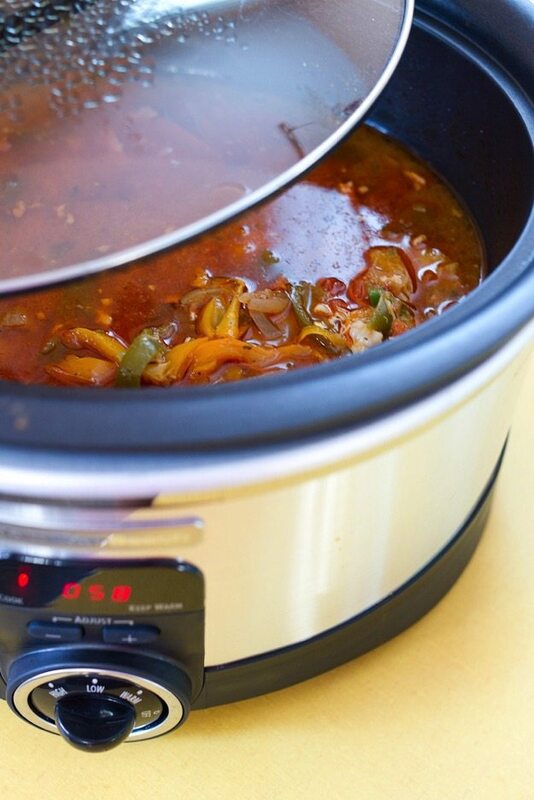 You can sauté onions and garlic or brown meat before finishing your meal in the slow cooker. How cool is that? Giveaway sponsored by Hamilton Beach. 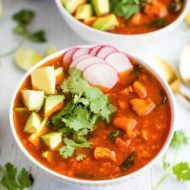 I lovelovelove anything Mexican, so this soup is definitely calling me name! 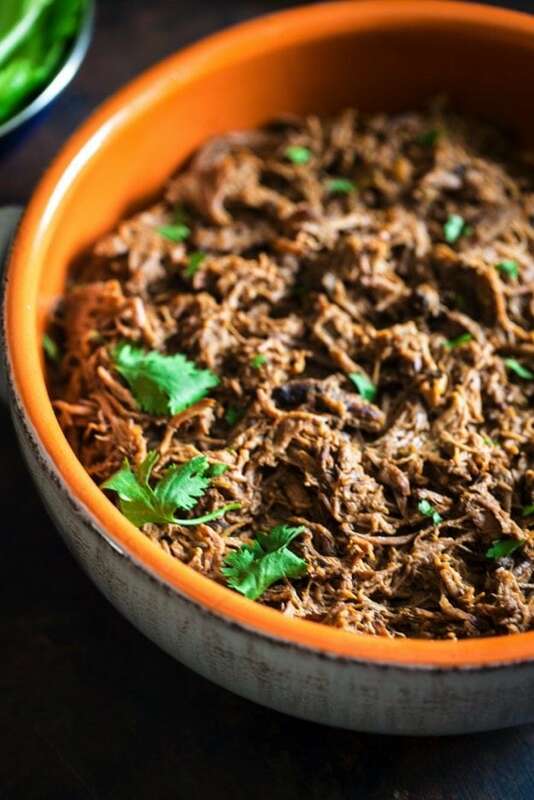 I can practically smell my house it cooks – great recipe girl! Pinned! This looks delicious! 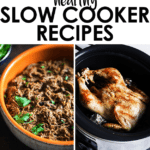 I’m a big fan of slow cooker meals, too! Even more reason to bust out my crock pot!! Haha, the slow cooker smell when you’re home all day is partly why I find it hard to get into slow cooker recipes! It’s like torture for 6-8 hours every time! I am all about my slow cooker lately. Right now I have some apples in there with red wine and spices. I went apple picking yesterday and need to figure out what to do with some of the apples! This looks amazing- love your blog! Question- can you use jarred salsa or is the fresh salsa best for this recipe? Just wondering as I have all of these ingredients but just not fresh salsa on hand! Me too! Doing a veggie soup this time. Yummy! Sounds perfect to enjoy throughout this season. I’d love a post of the slow cooker veggie soup. You can never have too many of those! Thanks Brittany! This looks delicious! How perfect for fall! I’m totally making this for dinner this week! I made this last night… it was so easy and delicious! Even my (sometimes picky) teens LOVED it! I really threw everything in the Crockpot around 2pm, turned it on high and it was finished by 5:30pm… just perfect. The avocado mellowed the spiciness of the salsa I used. Thanks for posting! I’m really excited to try this, but I LOVE mushrooms and want to add them in. How much should I add and would I have to adjust the other ingredients, especially the liquid ones? If so, by how much? Thank you!! Hi Erin. I apologize for the delayed response, but I think mushrooms would be a great addition. Adding about 1 cup of mushrooms should be fine and shouldn’t alter the recipe too much. Let me know how it turns out. Made this. Loved this. Posting tomorrow on my blog 🙂 Thanks!! About how much is one bowl? 1 cup? 2 cups? I made this today. Omg, this was so GOOD! I will definitely be making this again. Thank-you for sharing. 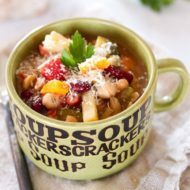 Can you make this soup without using a crockpot or slow cooker? Can you use frozen chicken or does it need to be thawed? Hi Becca. I haven’t tried it with frozen, but I don’t see why that wouldn’t work! This soup is amazing! I’ve made this serval times to the T ( Execpt I use jar salsa) and I’m in love and now share your recipes with others. I put a sprinkle of shredded cheese on top to melt into the soup with fresh avocada, cilantro and a small squeeze of sour cream sometimes extra dash of lemon. Which means it isn’t dairy free anymore… but the flavor is so worth it! I love to make a double batch and jar it up as a lunch Togo during the week!